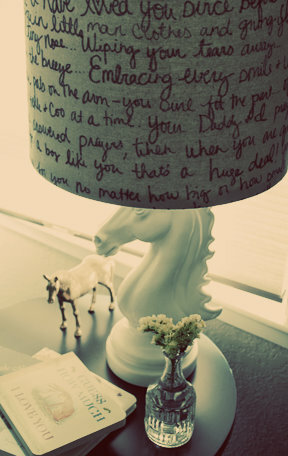 I am in love with love notes that are incorporated into home decor, like this lamp shade love letter from Little Glass Box. Olly's mama wrote a love letter to him on some linen like fabric with a sharpie marker. A sharpie!! So simple and easy and personal and beautiful and fun. You can check out how to make a love letter lampshade over ate Little Glass Box.